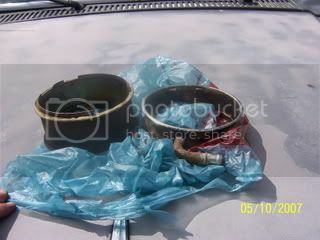 \n Wagoneerlover is at it again this time with a write up on D.I.Y TBI (Throttle body injection). I am not an authority on this subject and I don\'t claim to be. I simply attempt to help my fellow jeepers out there to work on and upgrade their rigs in the same fashion that I wanted to. I do write ups only on things that I have attempted, and succeeded at, that way i can at least get you from point a to completion. There are many on this board and on other boards etc, who are much more knowledgeable in this area than I am. So if I miss something or omit some info please let me know and I will add it immediately. (Of course this is within reason, I try not to add any info that I cannot verify myself, only because I don\'t want to give misleading information or post anything that I cannot actually answer questions on or verify. This article was written for those of you running V-8 AMC engines in your rigs, the buick and some of the other V-8 engines that were produced before my time that I have never seen would be similar in the adaptation areas, you would just need to figure out a few things. For those of you with the inline six engines, you may want to consider the chrycho multiport conversions before settling on a TBI setup. While the inline six can be adapted to TBI in a similar fashion to the 8, there are multiport setups and many have taken heads, intakes etc from the chrycho 242 engines (4.0 engine) and adapted it to the 258 thus creating a multiport setup. I must say that setting up and installing this TBI has been a great experience. Many argue that a well tuned carb will perform just as well as the TBI and that doing such a mod is almost useless blah blah blah (This may be true and for the ten people born in 1870 who are still alive who can super tune carbs then I guess that would be a valid point). For those of you are interested in such a swap there are several things that you want to consider before spending the money, effort and time to engage in such a modification. I agree that there are distinct pros and cons to installing TBI vs keeping a carburetor. Before I delve into the modification I will discuss some of the factors that you should consider before deciding to install Throttle body injection or simply keep your existing carb or upgrade to a better carb. If performance is your forte, then you should be aware of the fact that there are upgrades for TBI injection systems. Many will make the case that a 4bbl carb will outperform a 2bbl Throttle body any day. I agree that is true (At least in terms of horsepower gains) but for those of you willing to spend the cash they actually have 4bbl Throttle body systems. There will be four injectors mounted in the throttle body as opposed to two. Now how is that for performance? Secondly these injectors can be upgraded. Another performance option that I have taken note of is dual Throttle Body setups. These systems work in the same fashion as the hot rods that I have seen with dual carbs, only difference being that they have dual Throttle bodies. In the past such systems always had control issues when the computer tried to operate them, however there are now controllers which can handle them both effectively. I will not delve into the ramifications necessary for such mods, you will need to research them on your own. I will however detail as much as possible the methods necessary to adapt your rig to a stock 2bbl throttle body system. Before you attempt this modification there are many things which you will want to ask yourself and answer before going forward. First, how much of the project do you want to actually do yourself? This write up is written under the assumption that you will attempt to do most of the work yourself with little to no outside help. In this regard you will want to have distinct answers to the following questions once you have determined that you will go forward. How much of the work do I want to do myself? Should I simply purchase a kit and have some of the legwork taken out for me? Do I really want to spend the time pulling parts and gathering the things I need and installing them all and setting it up. Do I want to completely do this alone or will I do most of the work and get a third party to burn the chip for me (Sort of doing part of the work and having someone else do another part)? Before making your final decisions weigh your options and look at what is available out there on the market. There are pros and cons to complete systems, partial sytems custom systems and doing your own install (D.I.Y = do it yourself). I will not make arguments against the existing kits which are out there, nor will I badmouth any of the other developers out there. You should however be careul when being lulled into the claims of specialized chips made just for you and or other notions that might lead you into a hasty decision. Remember finally that when doing it yourself, you will learn the ins and outs of the system, you will have all GM parts for your fuel system which are easily and readily available on the shelf, and you will be able to tune, upgrade, repair and work on your system yourself at the completion of the D.I.Y install. \nAdditionally you will want to also consider the following things and reasons to simply leave the swap alone or go forward. \n 1. If you feel that you will magically go from the traditional 8-12 mpg associated with our rigs to 25 mpg then you are going to be disappointed and you will have wasted your time. Granted you can see gains of 2 or more mpg depending on how well you can tune your TBI but it is within limitations. If you truly want to get extremely high gas mileage numbers then you need to consider a diesel engine swap or an alternative fuel efficient vehicle. \n2. If you think that by adapting to TBI you will somehow magically repair a tired, old and worn down engine then you are gravely mistaken. Do not adapt any worn down engine to fuel injection. It just is not a good practice. You may see some limited amount of pep re-injected into your engine but I can assure you that your engine will still meet the same end. (Meaning the piston knock, head leaks etc that were plaguing it before might possibly sort of have a temporary band aid on them but eventually the same thing will happen and you will have wasted money investing in fuel injection and you will need an additional wad of cash to get the engine back into running shape, thus wasting time and costing you tons of cash.) An engine with TBI on it that is locked up and not running is not cool! \n4. If you have no patience and you need things done the second you install them. Trust me TBI may run extremely well but there will be a period of adapting things to your engine, wiring and tuning headaches. Once you have it all set up it will all be worth it. \n5. Do you want to actually spend the money to adapt to TBI? While it is not necessarily and extremely expensive mod, you can find the costs associated with this project beginning to skyrocket. This is especially true if you intend on getting performance out of your TBI with upgraded injectors or other mods. \n6. Any other reason you can think of that might deter you from wanting to spend time, effort and money in such a project. If you just don’t feel like doing all the work, have a tight schedule with work and kids and cannot find enough time to even drink a soda, or you have a nagging wife or husband who is keeping accurate tabs on the checkbook and giving you that evil eye when such expenses are mentioned. \n1.You seek to gain improvements in off-road capability. (This capability will be seen in the steep angle sectors etc. The TBI and other forms of injection will keep running and pumping even at weird and strange angles, often at angles where a carb would shut off. \n 2. You enjoy improved reliability in the area of starting. Walk outside on a cold morning and I can assure you that if you set up your TBI properly that cold weather will not affect its firing up. \n4. You seek a system which will adjust itself for altitude compensation and other areas which it may need to compensate in. No more getting out and adjusting your rig for above and below sea level conditions or for changes in weather and environment the TBI will do that by itself through the usage of sensors and computer control. \n Now that we have gotten through some of the reasons that you may or may not want to modify your fuel system let us actually get into the project. \n 1. Stud puller - Trust me you will need this to fully remove all remnants of your old carb. \n5. A cordless drill if you ddecide not to perform this swap in an area with sockets for a corded drill. \n14. You might possibly also need additional wiring. \n15. you will need 1/8 inch blade type connectors for the HEI module. Sometimes they are refered to as .110 style male connectors. \n1. A laptop (Notebook) computer - no matter what method you decide to go with you will need a notebook in some form or another. It doesnt have to be anything fancy with advanced graphics, and other gadgets that make it like a super computer. It will need to just be a basic laptop with usb ports. I dont know if the software will work with the new windows vista as this softawre was written for the older 16 and 32 bit operating systems. With vista being 64 bit you might have headaches (Not sure I dont have a system running it yet) For those of you running linux, or other operating systems you might have a headache, might want to consider dual boot or buying another cheap notebook for the chip tuning process. Software may however be available for linux, I just have not checked into it and did not notice it off hand. \n 2. A throttle body - from a 1989 -1991 gm or chevy vehicle. The older ones can also be used. I simply give this set of years as a reference point. There are supposedly some differences in the older ones but I cannot remember what they are. (new $300-$500 dollars) (Used $50-$150). \nOption 2. A 4bbl intake manifold like One made by offenhauser, I also think that holley manufacturers one (It isnt that some of the manufacturers don\'t make them, question is do they make them for the AMC engines?). This manifold should have the holley 4bbl sqaure bore bolt pattern. If your rig has an existing 4bbl manifold if it has te sqaure bore pattern then you should be ok with the stock manifold! For those with spread bore patterns or other patterns, I am sorry to say that you too will need an adapter or to change your manifold. \n4. Wiring harness -There are several options when selecting a wiring harness. \n5. TBI computer (ECM) – There are several computers out there and I must say that if you do a junkyard pull on the wiring harness then it is extremely important that you get the corresponding computer. The wiring harnesses have a few pinout differences and if you get a junkyard harness that works with computer A and you try to connect it to computer type B then you will be in a pile of mess. Some of the universal harnesses can work with multiple computers (Not all computers though. If you purchase a universal harness then check the manufacturers instructions. One of the most important things is picking up a computer that is heavily used and widely accepted in the aftermarket world. the two TBI computers that have the most aftermarket support and software are computer # 1227747 and computer 1228746. When you pull th ecomputer at the local yard check the numbers and make sure it is one of the two, preferably the 1227747 which has the most support of all the computers out there. If you get one at a parts house then specifically ask for that computer. There are other computers out there and many of them have aftermarket support as well, but some have few programs and or compatibility with the existing chip burning systems etc. so in other words if you get one that is not listed you might pick up one that is not widely supported and you will have a headache on your hands. Additionally there are many aftermarket chipped and modded computers and if you have decided to go with a 4bbl throttle body or a dual throttle body setup or a super duper throttle body etc then you will most likely need some type of modded or upgraded computer. Should you choose not to go with the stock setup make sure you look into purchasing the proper computer before proceeding. On another note, many of the aftermarket computers need to be set up differently from one who is using a stock computer. Some of the aftermarket computers have their own cables and do not need flash cables or other cables necessary to flash the chip. if you are purchasing an aftermarket computer make sure to read the manufacturers instructions before purchasing the flash chip machines, and cables etc. \n6. TBI to air cleaner spacer - when you pick your Throttle body up dont forget to get the spacer that goes between the throttle body and that air cleaner. There are different size spacers out there and if you have an aftermarket air cleaner that sits really high it can create spacial problems when trying to close the hood. 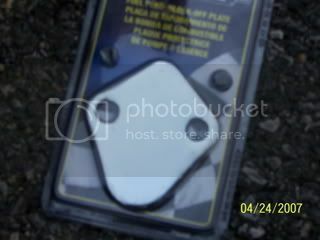 Secondly the spacer will fit the particular TBI that you have. some of them sit higher and some sit lower. its best just to pick up the one that is already on the vehicle that you pull the tbi from. If you get a new one make sure that you get the tbi and spacer from the same vehicle when giving the parts guys the vehicle info. Pictured below are two spacers, as you can see they are both different heights, yet they are exactly identical (Other than height wise) And they work the same. \nOption 1. - an external aftermarket fuel pump. The brand and type does not matter. What you are looking for most is the output of the pump. In this case external would mean any pump that is mounted outside of the tank. Typcially most mount it on the frame rail but some have mounted it in other places. I personally purchased a carter brand pump that puts out the 12-14 psi of pressure needed for TBI. If you are tuning your TBI for performance you may or may not need more than this. You can purchase pumps that put out more than this, however you will need a fuel regulator. (Some of the new efi pumps put out 30 - 50 psi or possibly more.) Needless to say these would need to be regulated to maintain proper pressure. 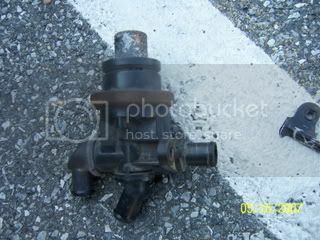 Pictured below is an external fuel pump. \n9. Gm HEI ignition module - You may use a 7 pin or 8 pin GM HEI ignition module. It doesnt matter the 7 pin can be installed inside of some distributors. THe 8 pin is very large and will need to be installed externally. \n10. An oxygen sensor bung - this is just a little circular shaped thing that is welded into the exhaust in order to mount the oxygen sensor. Pick one up at your local race shop etc. \n2. VSS (Vehicle Speed Sensor) The Gm rigs use mainly 2 pole and 4 pole vss\'s, you may retain your stock vss. The stock waggy vss is an 8 pole vss. I know that the newer rigs have them but not sure about the older rigs. It is at the end of the speedometer cable, it is a little box shaped thing with two wires coming off (In engine compartment near brake booster.). You will need to change some settings in the computer should you retain it. You may also swap in the vss from the gm vehicle. if this is the case make sure to pull the complete speedometer cable. \n Option 1. 1 wire 02 sensor - (In my opinion the worst choice, The 1 wire 02 sensor is simply just that. it has 1 wire coming off of it. This wire is the sending unit line. There are no ground wires and the assumption here is that your vehicle exhaust will ground out the sensor. This sensor is not heated and it takes a while to warm up enough to give accurate readings. \n Option 5. Wide band O2 Sensor - The wideband O2 sensor takes things to a new level. This sensor actually has computer components and a computer that will need to be wired into and integrated into the system. It is a big headache to get it all set up and get it to work with the TBi computer or other fuel injection computers, however once it is up and running it provides results that are amazing! Should you decide to use the wideband sensor you will need to spend time wiring the computer for it into the system, setting it up tuning it and getting it to colaborate with the fuel injection computers that you are running. (It is the ultimate in terms of accuracy, precision and advanced sensors.) Unfortunately, the wideband systems (I say system because you need the computer controller and the wideband sensor itself) that I have come across are quite expensive. However if price is not a bother go for it! \nEmmissions - I am listing the emmissions equipment seperately,. There are those of you who have emmissions exempt vehicles and those of you who will choose not to use emmissions equipment. I have to use the emmissions equipment so my article shall detail how to do so and how to activate it. For those who choose not to use it, please check your local smog stations on legality of ommitting emmissions equipment, as there are strict laws regarding emmissions equipment and it\'s removal or adaptation. \n1. Charcoal canister - Get the charcoal canister from the stock gm vehicle of your choice with TBI. The canister is a sealed type (Unlike my rig) And it has various properties that will affect emmissions and the computer etc. \nWell what are you waiting for everyone? why are you still reading and not getting out there and getting this TBI set up and installed on your rig??? Let\'s begin shall we? Below I shall begin to detail the steps necessary to get everything set up and installed on your engine. \n1. Initiially, I began the project by getting the oxygen sensor bung installed in the exhaust. I had it installed in the y pipe on the drivers side. I actually did this before I technically begin the project. The carb was still in the vehicle and I was weeks away from doing the project. The reason that I feel it is important to do this step first is this. If you still have the carb in the vehicle you can drive to the exhaust shop and have them weld in the oxygen sensor bung and install the oxygen sensor. This can be done and it wont harm anything and you can drive home. The sensor will be installed and there will be no headache involved. If you dive into the project and figure out later on that you need to have the bung and sensor installed then you will have to pay towing fees to have the rig towed to the shop, or you will have to re-install the carb and drive there. For those of you with mig welders and other tools needed to work on your exhaust and weld in objects etc. you can ignore this as you have no concerns in this area. \n Line the TBI up with the adapter plate or the stock holes for those who need no plate. Make sure you install a gasket under the TBI before installation. Torque the TBI down to (Will get number later). There are three bolts that hold it down and I hope that you pulled them when you pulled it at the junkyard. Take your stock throttle linkage and stab it back onto the clip at the top of the control arm. it isnt exaclty the same as stock but it will clip on and stay. There should be a hole near or behind the throttle port for the cruise control arm, (If not just drill one, I had to). Lastly the hole you drilled out for the stock trans linkage will simply need a bolt of some type to hold the trans shift linkage. Use a nut at the end after pushing the bolt through. For those who have 700r4 trans or other trans where the linkage connects with no mods then just stab it back on and get ready for the next phase. \n4. In school you always learned to tackle the hardest task first, so next I decided to go to the conversion of the distributor. (you will need to convert your distributor in order to allow the computer to control timing. etc.) If you have a stock distributor or aftermarket distributor don\'t worry they can be converted too. For my particular application I have an existing GM HEI unit. Below I shall detail how to convert it, for those with other distributors the conversion will be similiar and you can use this as a basis by which to go by. \n5a. For those with the GM HEI distributor the conversion is a sinch. If you purchase the 7 pin HEI distributor module you can re-install it back in the cap!. Well lets move on now to the actual conversion from a mechanically and vacuum controlled system to an electronic computer controlled system (Note some out there have bypassed the computer controls of the ignition and kept vacuum and mechanical controls. Should you need to do this it can be done. I just don\'t see why you would want to as you will be losing certain aspects that make Fuel injection so attractive. Secondly I wont detail how to do it so again your own yor own!). The first step of course is to set your timing to TDC (Top dead center. make sure that it is on the compression stroke and not on the exhaust stroke, otherwise you will have a huge headache on your hands when you pull the distributor assuming that you need to pull it. Actually the conversion of the Big cap was so easy that when I look back now I would have left it installed. Next after setting the timing to TDC, pull off the cap from the distributor. make sure that you put some white marks or some other marking on the case in order to let you know where the #1 spark plug lies. 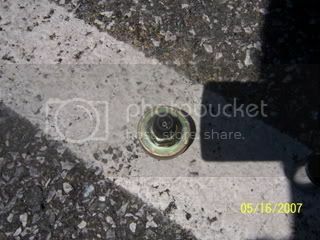 (if you pull the cap and have set the timing at TDC you wont harm anything if you dont mark the location of the #1 plug. Any plug can be used as #1 just remember to change the plug wires to line up with the new settings if you change things.) 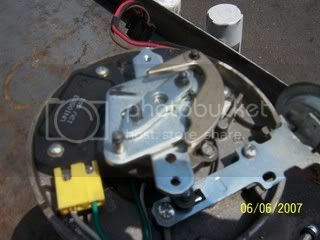 Pull the rotor off the distributor next by removing the two screws that hold it down. Once the rotor is removed it should expose the mechanical advance weights. These weights need to be removed. They are held in by a few springs and I think a c clip or two. Remove the springs and the clips and take the weights off. In the pic below you will notice that one mechanical advance weight has been removed and the other remains. Once the weights are removed you will notice the mechanical advance arms. These arms will move freely back and fourth with the weights removed. (This is a bad thing for the fuel injected rig) The computer will control the advance so these arms need to be locked in place. You may use lockwire as I did, you can weld them in place, you can drill them and put screws through them or whatever method you choose as long as they dont move. Make sure that before you lock them in place you position them in a way that the rotor can be re-installed once finished. The first time I locked them in place I locked them in the fully closed position. The rotor screw holes did not align with the mechanical advance arm holes in this position!! (You need to be able to re-install the rotor!!). Once the arms have been locked in place you can turn your attention to the vacuum advance module. You have two options here, you can either leave the vacuum advance unit in place and simply remove the vacuum hose running to it which will disable it. 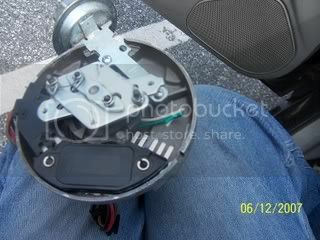 The other option is to remove the vacuum advance module and to place a screw through the reluctor ring pin. (The vacuum advance module holds the reluctor ring in place and advances it etc yet if you remove the vacuum module you need another way to hold it still. Dont worry again the computer controls this now!) Once you have decided you may now turn your attention to the control module. The control module for the HEI is toward the rear of the case. It should have four pins with wires connected to each pin. Don\'t cut or splice these wires just yet, you will be re-using them on the 7 or 8 pin module later. If you have purchased the 7 pin module that is great as you can re-install it back in the case where the old 4 pin went. (It will fit with slight mods) Remove the connectors that are attached to the 4 pin HEI module. You may need to remove the module first. The module is held in place by two phillips head screws. simply remove them and unplug the connectors and remove the module. if you notice there is thermal grease all over where the old module used to be. Clean this up and get ready to install your new 7 pin module. Test fit the module a few times. It has tabs in the front and also two screw holes. The tabs in the front will fit in the stock position yet the screw holes will not align. You will need to drill new holes in the case. \nOnce you have drilled the new holes, take the new packet of thermal grease that came with your module and apply it under the module and install the module in the case. (Do not install it without thermal grease! The modules get extremely hot and it will overheat and destroy itself within mere minutes!!! your project will end there and you will be shelling out another 35-75 buckst to get a new module.) next we move on to the wiring phase of the module. With an internally installed module you will need to drill a hole in the Distributor somewhere so that you can run the wires out of the distributor case and out to the GM harness. (Yes there is a plug for the distributor wiring on the Throttle body harness.) Anyway, everyone has their own theories on where the hole should be in the case so i wont dictate to you where to put it. I drilled one beside the left side of the module and put a grommet in the hole and ran the wires out of it. You of course will be running five wires to the module. Two of the wires are already in the case and the new 7 pin module will plug directly back in to them as did the original 4 pin module. Take a good look at your new 7 pin GM HEI module. The module has 7 pins and each pin has a letter number or symbol beside it. I shall detail the pin setup and what wires go to where and I shall list out what each wire does in case you mix them up. You shall attach the wires according to what operation it performs. Take note not to mix them up or install them incorrectly or your vehicle will not start. You will need 1/8 inch or .110 blade type connectors to fit on the pins of the module. The larger pins connect back to the stock connectors. Below is a detail of the pins for the 7 pin module. \n1. + pin - this pin is the pin that is the power wire for the module it needs to be connected to a 14v power source.. Typically it is connected to the ignition coil positive power wire. If you have the HEI big cap distributor simply reconnect it to the same terminals that the stock 4 pin was connected to. \n2. 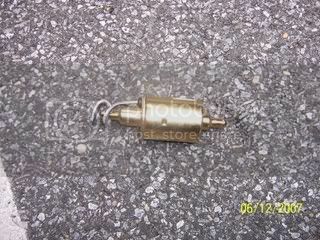 C pin - This pin needs to be connected to the ignition coil negative terminal. So run it from the module to your ignition coil negative clip. If you have the HEI big cap distributor simply reconnect it to the same terminals that the stock 4 pin was connected to. \n3. Pin P - This pin is the one of the reluctor signal pins. It needs to be connected to the positive wire from the reluctor inside of your distributor. \n4 Pin N - This pin should is the other reluctor signal pin. It needs to be connected to the negative wire of the reluctor ring inside the distributor. \n5. Pin E - is the spark timing signal pin. This pin needs to be connected to the white wire one the connector that connected to the stock GM distributor. there is a 4 pin connector. run the wire from this pin to the white wire on the connector. \n6. Pin R - is the tachometer signal pin. This pin needs a wire connected to it that runs to the purple and white wire on the distributor connector from the GM harness. \n7. Pin B - is the override cranking signal pin. This pin needs a wire connected to it that runs to the GM distributor connector wire that is tan. \n8. The 8th wire is not a wire that is connected to the module, it is actually connected to the distributor connector on the GM harness. It is a ground wire and it is typically connected to a ground in the case. It can be grounded anywhere that you like. the wire is black and red. \nAdapting the stock distributor, using the 8 pin module and other aftermarket modules where the module will be installed outside of the case (Externally). \n1. Pin G (8 pin module only) This is actually a ground pin. Connect a wire and ground it out somehwere. either on the case or the body of the rig or wherever you choose! \nYour Distributor has now been converted and it is ready for electronic control! lets move on to a different phase of the conversion now. \nBack when I "commuted" annually from 1,000\' in Carolina to 12,000\' in Colorado, it was just simpler & less smelly to swap carbs somewhere in Kansas than to dig down to jets & such in a 2150. I even had a favorite rock under which I would leave my "low altitude" carburetor for retrieval on the way back east. I tried bypassing the swap a couple of times, and that resulted in melted plugs & hammered pistons back east or about 30 HP & 4 MPG at altitude, plus tear-inducing richness right when you want to breathe good thin air. The 2150 is an "altitude compensating" carburetor, but that compensation is only good for maybe 5,000\' of change. \nI jumped onto the GM TBI bandwagon via customefis. I\'d have preferred to do it myself, but was severely stretched for time just then. The setup worked great right out of the box, but there have been a few little glitches since, which of course I\'ve had to finagle on my own. I really wish I\'d been able to take the time to learn all about such systems before having to rely on the durned thing, and I\'m sure that I eventually will have to anyway. \nAs for choosing an ECU, just get a 1227747. Supposedly, they\'re all the same, and by far the best supported thing around. That said, I\'ve gone through several from junkyards before finding one that worked decently with my custom chip -- who knows what GM may have tried over the years and failed to document. \nForget 4-bbl vs 2-bbl -- that\'s carb-think. GM saw fit to make a larger-bore throttle body for the 454 motors, but that was likely an adaptation brought about because they didn\'t expect the big-block to remain viable into the era of fuel injection. Otherwise they\'d have just sized the standard throttle body large enough from the get-go. Using the larger one on a smaller motor like a 360 won\'t hurt a thing (it\'s not quite like carb sizing in the old days because fuel atomization is not a problem), but the big ones are rarer and so more expensive. If you have a 401 that sees more than maybe 4,500 RPM you need the big one or you may as well have a 360. The 454 throttle body will come fitted with larger injectors than will a small-block or V-6 piece, so you\'ll have to work that out as well. \nSpeaking of injectors, they\'re pretty much the only mechanical wear item in the whole deal (everything else just fails randomly), so it\'s not a bad idea to budget for brand new ones, or have old ones rebuilt & blueprinted for about the same cost. Carrying spares of everything is always a good idea, and TBI sensors & such don\'t cost more or take up more space in the toolbox than anything else. The\'re also less smelly than a spare carb, and take fewer tools to diagnose & fix. \nAn AMC 360 will run more or less decently on a stock GM 350 chip, but you could do better in a fixed environment with a well-tuned carb. If you operate your Jeep in diverse altitude/temperature/angle situations, even that stock chip will probably pay off. To get it really right you\'ll need some tuning, and that takes datalogging & chip burning software. I know a lot less about that than others here, so I\'ll shut up and wait for them to chime in. \nPS/Edit: Oh, one other thing. Unless newer software than the ALDL datalogging stuff I have has been invented, or someone has figured out a cable that works with USB, you\'ll need an older laptop that has a com1 port, a thing most newer ones lack. \nThe newer laptops work fine with winaldl and a usb to serial cable. \nI run up to 4 devices at one time on mine. \nFrom a wideband O2 system to a real time tuning adapter. \nI will add that if you try to use the BBC TBI on a small block motor you need to be able to tweak the chip your self. \nThere are way to many differences for the stock chip to compensate correctly. \nEver thought of posting this on a webpage complete with links and pictures instead of a thread? Just curious is all. \nWhen this is finished it will definately be archive material. \nI considered posting this on a webpage, however, I actually decided to post here for several reasons. \n1. I have always had a warm reception on this board and you guys have answered my questions without hesitation no matter how stupid it was or how often it had been asked. Try asking a question on some of the other boards out there and see what happens! Some of them are ok but there are some where they might tear off your head, resort to name-calling or who knows what else. (Not all of them are like this so don\'t take offense anyone). Secondly, some of the other sites are pay sites, this board has always remained free and I have noticed like a 98 percent comradery level here. Some of the other boards are flame wars galore! \n2. If I post it on a website then others can access it. It isnt that I am hiding it but I feel that those who want to access the info should become members of this board. You guys have always treated me well and I feel a certain level of loyalty to this board. Hence it would be a great tech article. I would not mind sharing the article with others out there with AMC engines, maybe the board administrators can start up a sister site, like a cj board or a alternative vehcile amc board (JAvelin etc) Just a thought. \n3. If I do put it on a website then I have to design it etc. (I know that there are one sout there that are easily set up etc, however I like to design my own webpages etc so that I can put my own flavor on it.